Still working on build. Preliminary tree/gear posted below. I designed this build for several reasons. I wanted to create my first build and spectral throw has appealed to me for a long time. 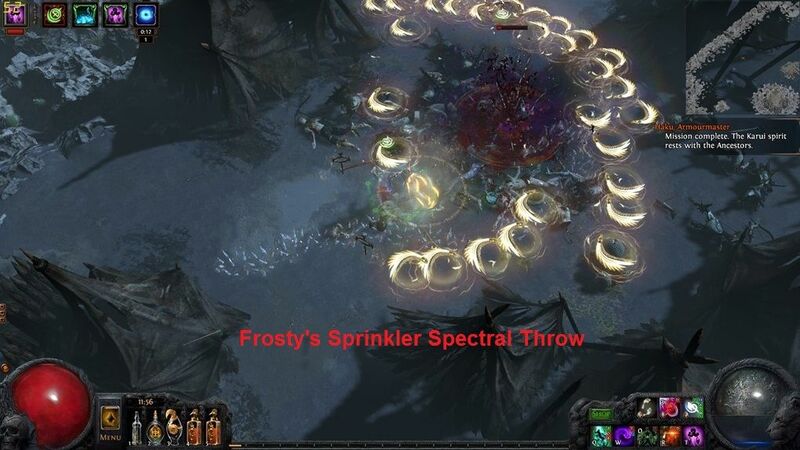 I looked into existing spectral throw builds, and there was a clear lack of guidance. So, I created this build which relies on physical/chaos damage and damage over time from Bino's and the Assassin ascendancy tree. I have had quite a bit of fun and success with it so I wanted to share. [3.0] Notes: Early impressions are this build was nerfed a bit. Still viable for mapping effectively, at least until T12's. DPS took a hit, but it seems survivabilty improved. Will I like this build? - Do you like little purple explosions? - Do you like super fast movement speed? - Do you dislike meta builds? - Do you want to face roll maps? Bandits: I chose Oak. Kill all is also an option. I found mana issues were resolved somewhere around level 40-50 after picking up the mana leech nodes. As damange (particularly pDPS) picks up mana issues go away. I noticed my DPS started falling off around level 80, though I had minimal invested at that point (5L, 2x Bino's). Survivability was surprisingly good at that point. If you notice damage is getting low, I would suggest trading some survivability for damage. Maximizing poison is likely a solution here. Dendrobate chest, trading some life for poison/bleed/ailment nodes will also help here. If you have any questions or comments leave them here. I will continue to check this regularly. Could you add a leveling guide for the passive tree, as i would love to try this build! Absolutely, I will work on this today. Can i ask, why didn't you take the phase acrobatics node? For the investment of 4 more points I don't really feel it's necessary. This build already has several layers of mitigation allowing it to survive very well. Is the helmet's enchant important for fast clearing? The helm enchant is something I would add to the build later. Definitely less important than the daggers and maligaros as far as adding dmg to the build. Hey just wondering when do you actually change over to added chaos dmg,peirce, void gems etc ?? ?